How much milk does a newborn need to drink each day? Newborns need 100 to 120 kcal per kg per day to grow. 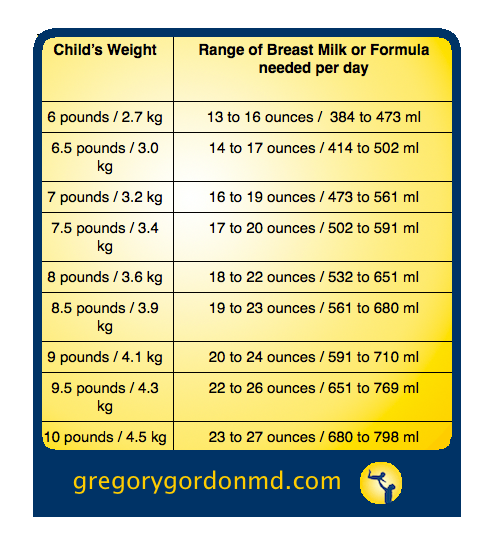 Knowing that commercial formulas and the average women’s breast milk contains 20 kcal per oz a table can be derived. The above ranges are only guidelines. Your child’s growth is the best way to evaluate their milk intake. In my practice, if children are developing and growing well I usually do not ask about milk intake. How long can you store breast milk? How will I know my breast milk is in?